So it's true. Duct tape is perhaps man's second greatest invention, right after the wheel. 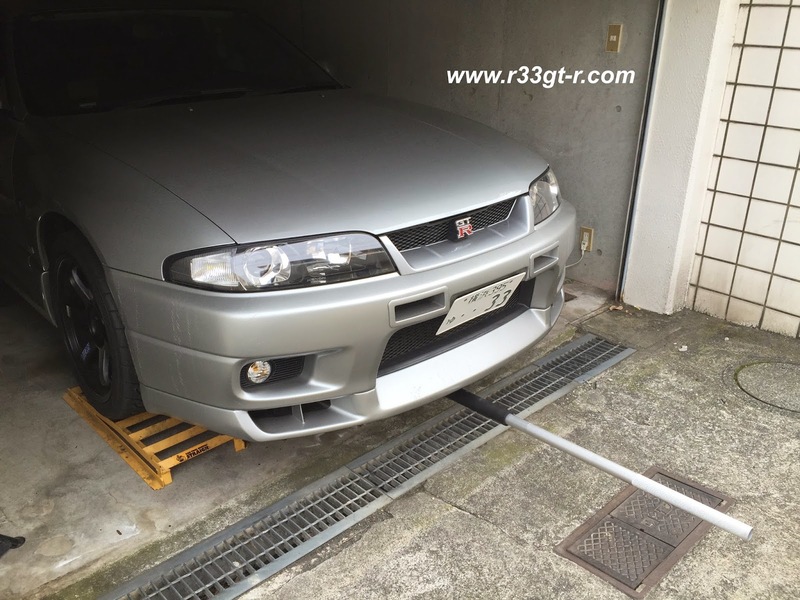 After my car was lowered, and especially after the installation of the Do-Luck roll center adjusters, I had noticed more rubbing by the front tires on the plastic inner fenders than usual. This usually happens in tight quarters, making turns below speeds of 20kph. In other words, each time I leave my house in my neighborhood, I hear the awful sound of rubber against plastic (the fenders). Anyway, last time I took the car out, I was surprised to see, that the front left wheel had worn though the "highest" point of the fender - revealing a 12mm bolt! 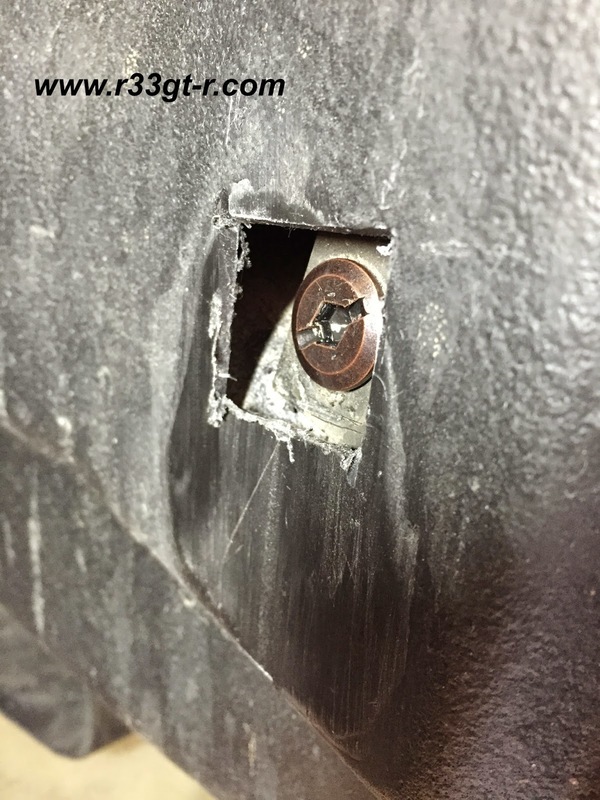 This bolt holds the OEM blow off valve, or some part of it, in its position under the fuse box. Obviously, not good. Rubbing up against plastic I could deal with, because the rubber tire isn't going to be damaged. But now with a bolt sticking through, could this lead to damage to the tire? In any case, I wasn't going to take any chances, so asked my Club R33 Facebook friends for some advice. 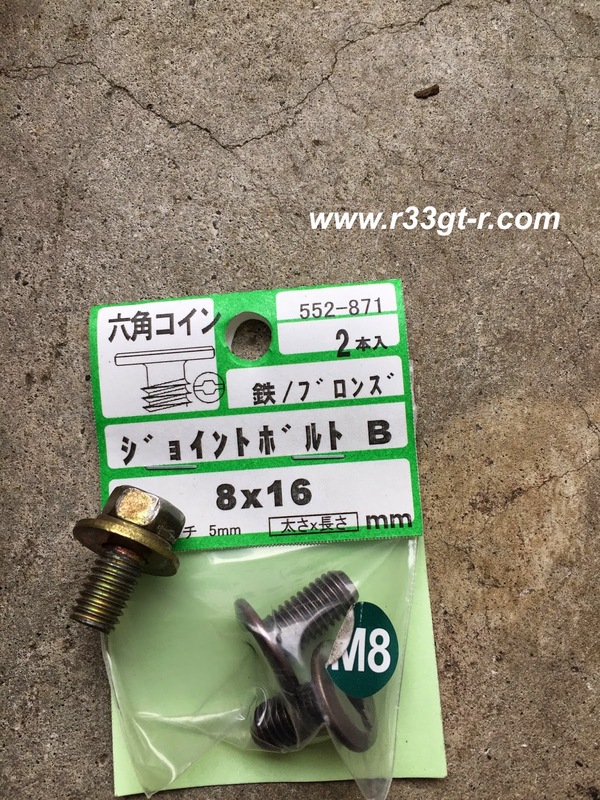 The ideas (all from first hand experience it seemed) ranged from taking off the fender liner and either removing the OEM blow off valve, or moving the BOV forward a few millimeters, to removing the bolt entirely, to replacing the bolt with a flat type bolt. So last Sunday, as the weather was finally warm and it wasn't raining, I jacked up the car and removed both front wheels. 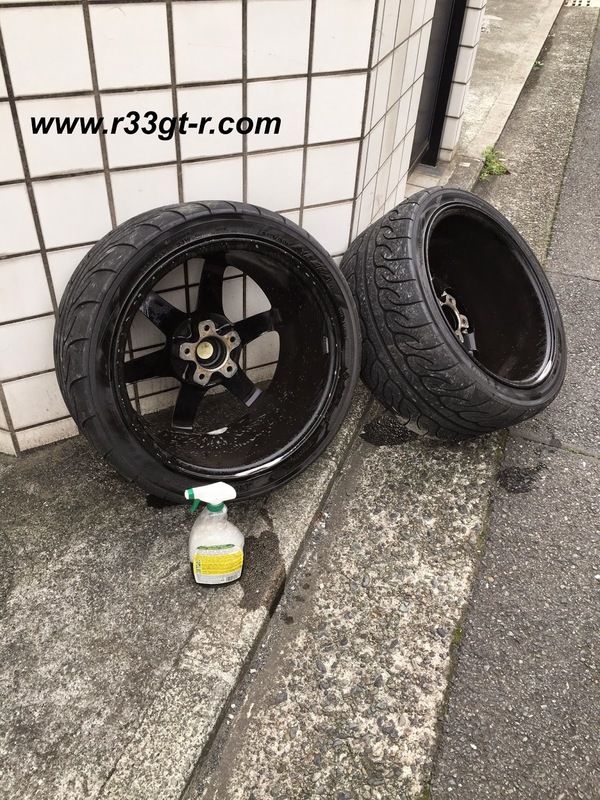 On the left, clean wheel. 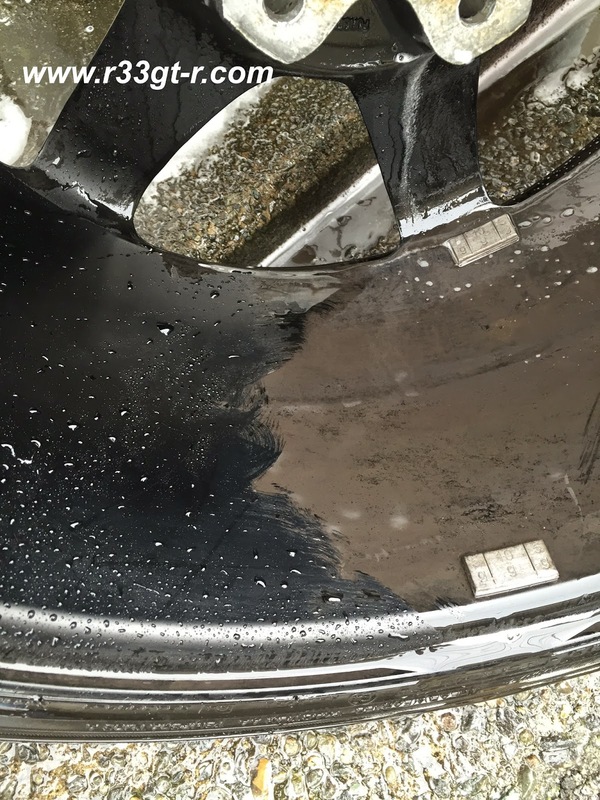 On the right, a layer of brake dust. Yuck! 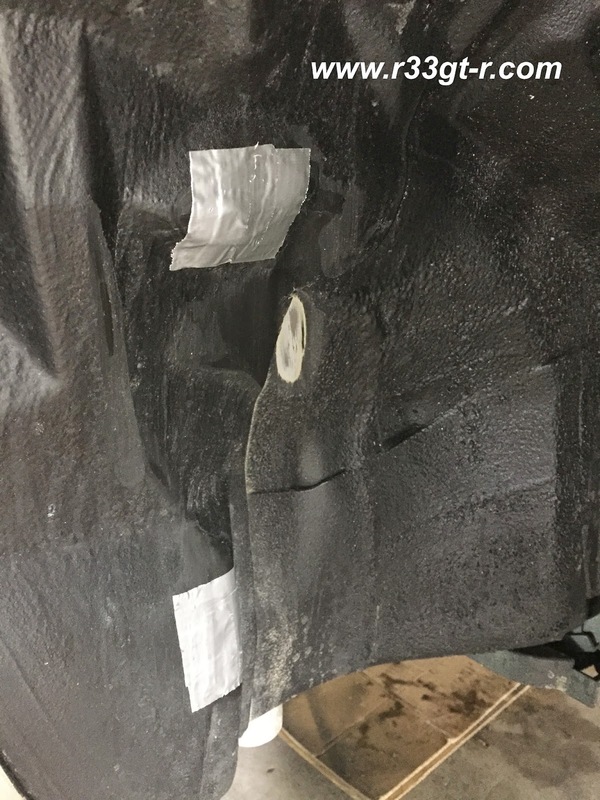 What I immediately realized that, in order to take off the front inner fender liner, I would have also remove my front diffuser, as well as the brake ducting, to access the bolts on the bottom. So what I thought was going to be a simple 30 minute job was threatening to become a 3 hour task. 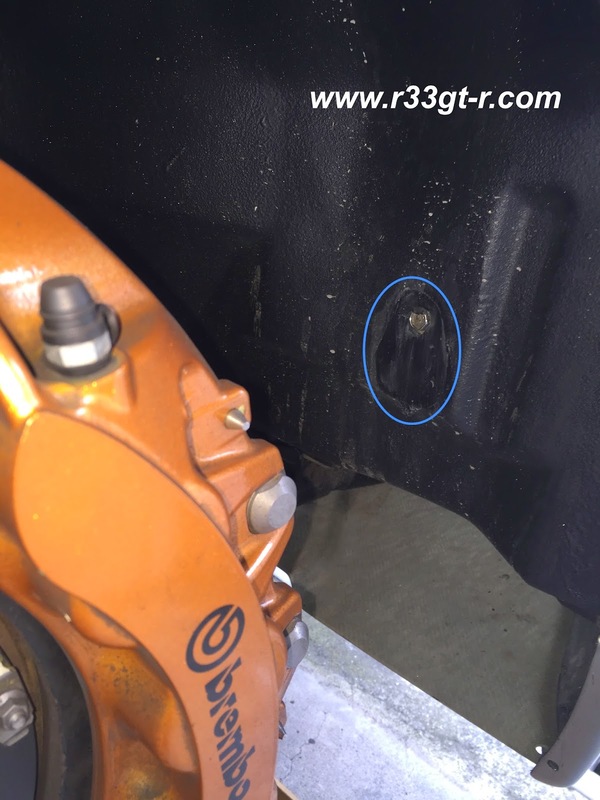 Feeling lazy, I decided instead that I would cut the plastic around the protruding bolt to see if I could see anything, maybe access the BOV that way. 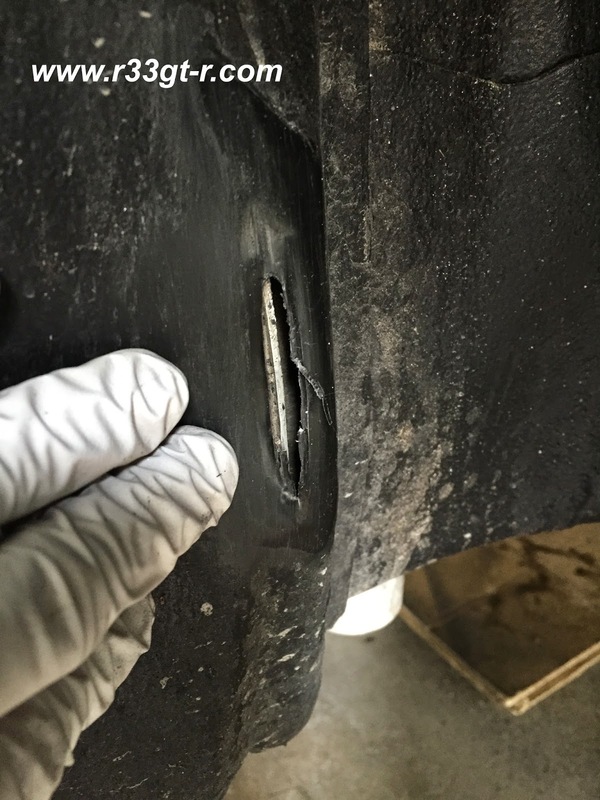 At the same time, I started looking around the entire wheel well, and then discovered to my surprise that, not only had the tire worn out the plastic in front, but it had also rubbed through in 3 places BEHIND the tire as well. The middle shows where the undercoating had worn through, showing the primer! had already been worn down! which then sits nice and flush, at least 5mm difference (no washers)! Obviously, at this point I realized that the long term solution is either to remove the plastic liners, and bend back all the metal that is causing the plastic to wear, and the use a heat gun to mold the plastic out of the way of the tires - OR, it is possible that raising the car a few millimeters up front, would also accomplish the same thing without any metal bending. I will have to consult Ito-san at Do-Luck about this next time I see him. I also found that the lower most bolt of the fender liners was missing on both sides, so I went ahead and found bolts to replace those missing (this also cause the fender liners to stop flapping about so I'm happy). In any case, while the car looks great with the lowered profile, I will have to figure out which permanent option is the better one, long term. I haven't bothered taking the car for a drive yet as I'm sure the rubbing will continue so long as I don't do one of those two options. Stay tuned! Mine has also been rubbing on the right side, but only when the wheels are almost turned to the max. Never had a look what it is! On the note of that i really need to buy jack and a few ramps, what kind of heavy duty jack are you using that i see in that picture? sorry just saw this! The aluminum, low level jack is something my friend Miguel picked up at COSTCO for me a few years back... sorry I don't have the specifics!